Each time you slide your fork into a warm cake and watch as the steam escapes while your kitchen fills with its sweet scent, you realize there’s nothing quite like the warm fuzzy feeling you get from eating a homemade dessert. 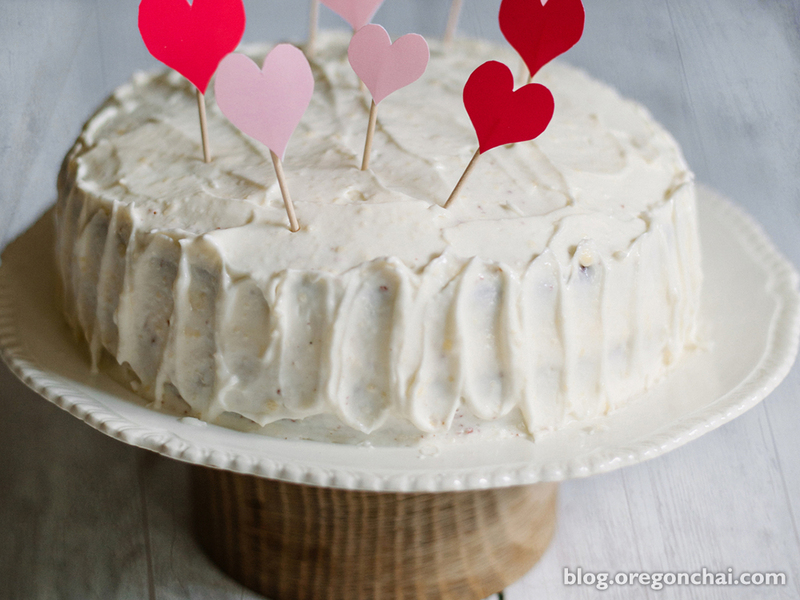 Share that feeling with your valentine by baking him or her one of these delectable cake recipes inspired by chai. Chocolate and chai go together like you and your special someone. We just hope you can manage to save some for them. Preheat oven to 350 degrees. Generously grease a 9-by-13 inch baking pan or two 9-inch round cake pans and set aside. In a large bowl with an electric mixer, beat the egg yolks until they are pale yellow and fluffy. Add 1 1/2 cups sugar and beat to combine. Sift together the flour, cocoa, salt and baking powder. Add slowly to the egg mixture while beating. Stir in the chai concentrate and vanilla. In a medium bowl, beat the egg whites with the cream of tartar until foamy. Gradually beat in the remaining 1/2 cup sugar and continue beating until stiff, but not dry. Gently fold the egg whites into the cake batter, being careful not to deflate the whites. Pour into prepared pan and bake for 45 minutes for a 9X13 inch pan or 35 minutes for two 9-inch pans. A toothpick inserted in the center of the cake should come out clean. Cool completely before removing from the pans. Valentine’s Day is a tough time for those who aren’t sweet on chocolate. Luckily, you don’t have to miss out on the love with this rich cheesecake, sweetened with vanilla, chai and spices. Simmer 1 cup Oregon Chai Original Concentrate until reduced to 1/2 cup. Cool. Preheat oven to 350 degrees. Mix together melted butter, 2 tbsp sugar, Nilla wafers and 1 tsp ground cardamom to form the crust. Press well into the bottom of a greased 9-inch springform pan. Bake for 12 minutes. When you take pan out of the oven, reduce heat to 290 degrees. Beat cream cheese with mixer until smooth. Add chai reduction and vanilla, blend just until smooth, scraping down sides as you go. Add sugar, cornstarch, and spices. Add eggs, stir by hand until just incorporated. Pour into springform pan, sprinkle a little cardamom on top. Put a baking dish with 1-inch water in the bottom of your oven. Cook cheesecake on middle rack for 55 minutes. Turn off oven, just barely crack oven door until steam stops coming out (30 seconds or so). Close it back up and let it go for another 55 minutes. Take out of oven, slide knife around the edges of the pan to release cake and allow for contraction while cooling. Place on a cooling rack and cover with a large bowl. Let cool until room temperature, then move to refrigerator. When cold, freeze for longer storage. Show your love that they’re the apple of your chai with this twist on the classic apple crumble. Apple pie and chai spices marry to create the perfect treat for two. In a large bowl, combine flour, sugar, baking powder, baking soda, salt and cinnamon. Add butter and mix until crumbly. In a separate bowl, mix together Oregon Chai Original concentrate, egg and vanilla. Blend into flour mixture and spread in a 9×9 inch greased baking pan or into a small Bundt pan. In a small bowl, mix flour, 1/2 cup brown sugar and 3 Tbsp. butter until crumbly. Set aside. In a saucepan, sauté apples in 2 Tbsp. butter for approximately 2 minutes. Add Original Chai concentrate, cover and continue to cook for 2 more minutes. Spread the crumb mixture on the batter. Spoon apples over the top and sprinkle with remaining brown sugar. Bake at 350 degrees for about one hour or until the top is golden brown and a toothpick comes out with moist crumbs. Let cool 10 minutes. i want to get the recipe brochure for chai. Thanks. My address is 7854 red clover dr . Indianapolis, ind. 46227 in the case. Hi Eileen—We do not have a recipe brochure. You can find all of our recipes at http://www.oregonchai.com/recipes/. Thanks!